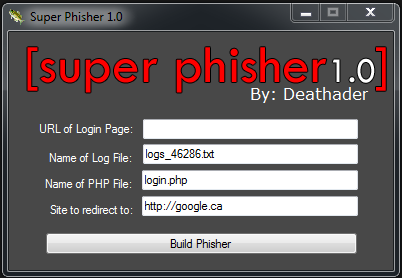 This is the second part of '' Create Fake Login Page of any site with Super Phisher Tool ''. Many people said that the tool is not working properly and few were saying that they are facing problem in uploading it.So in this post I will make everything clear to all. Now after downloading it,run the tool and enter the URL of the site you want to create phishing. 4.Upload the two file that was generated by the tool or downloaded. 5.Give the link of the site you created to the victim.after someone enters the ID and password in the phishing page open the file manager.you will get a new file uploaded there.open that file and you will be able to get the ID and Password. But this is not the end.There comes a problem,facebook has blocked all free hosting sites.So if you will give your site link to the victim via facebook,it will be detected and you will not be able to get the ID and password.Wait for my next post where i will discuss how to bypass facebook's Link detection. Today I am going to explain you how to make your own Phishing page without any sort of copy & pasting but just with a simple click. * Simple and easy tool which can be used even by a 10 years old boy. *Create any fake page. For ex- Facebook, Gmail, Yahoo, Hotmail, etc. * Download Super Phisher here & Extract it. This is my favourite trick for hacking email accounts. I used it on many people and most of people are hacked. Success of this trick depends on the art of sending fake links to other people. Main theme of this trick is create fake pages which look like original website but work according to your programming. When user login in this fake page assuming it as a real website. The user id and password would be in your email inbox. For uploading your pages to web you should have an hosting account with some web host without any banner or ad. use this link- free web hostsCreate an account in any of web host and upload your pages to its root directory. But make sure your hosts support mail sending from scripts. Suppose you are going to make Gmail phishing page. Open Gmail login page and save this page to your computer. Now open its html coding and find out form tag inside the html coding. Change action page to your script page which will send you email of hacked user id and password. Page will look like original Gmail page but it will send data to you. Now create the script page using any of language such as php, asp or any other.